It's been a long while since I've seriously tied flies. If asked, I would still list flyfishing/flytying as one of my two most serious hobbies; but it has nowhere near the intensity for me that it did 10 years ago. This isn't a good thing or a bad thing. Life moves along and interests change and evolve. I feel very lucky to have had, throughout my life, interests I felt passionate about. Usually, they involved some sort of outdoor activity and have an equipment component, with two past examples for me being backpacking and triathlons. I remember a relationship expert saying that honeymoons last five to ten years, and that at some point it just becomes too difficult to maintain the intensity that goes along with a new relationship. Perhaps the same is true of hobbies? In terms of fishing "outings", I've pretty much maintained a constant interest in getting on the water. I've never been a 100-day flyfisherman like a couple of my closest fishing buddies. For me 20-30 days a year has always given me the balance I needed. Though I still maintain this blog and my fishingwithflies.com website, additions are less frequent (but not inconsequential, IMO.) Blog: I see I wrote 26 blog postings in 2011 and 25 in 2012. And there were over 4,000 visits last year. Website: Though I have only added a couple of pages this past year, because of the website having 10+ years on the world wide web, readership is still high. It numbered 60,000 visits last year. I no longer thumb through the latest catalogs, putting "stickies" on pages with equipment or supplies I wanted to consider buying. I have all the equipment I need or want. I probably had all the equipment I "needed" years before I stopped buying all the equipment I "wanted". I can't remember the last time I even flipped through a Cabelas Flyfishing Catalog. I used to love the Feather-Craft catalog, but don't even know if I still get it. I used to speak frequently with Jim Kruel at English Angling Trappings and Chris Helm at Whitetail Flytieing [his spelling] about tying materials. As far as fishing equipment, I have more than many and less than others. My rod rack is full with about 8 rods and the little drawer under it has 5 reels in it. The past several years I have used only two of the rods and two of the reels. I am sure there have been many fly line "upgrades" over recent years and all kinds of specialized lines for all sorts of fish. But I am perfectly happy with my classic Cortland 444 (peach colored) lines. All the smallies, largies, trout, sunfish, pickerel, perch, rock bass, fall fish, and crappies that I caught last year were perfectly happy with the distance, accuracy and color of the 444 peach! I am amazed that I have four tying vises. I plan to sell my Regal and Dan Vise. That would leave me with two vises that go well beyond my skills: the LAW bench vise and the JVice. Both were bought during more passionate times. They are beautiful machines. The LAW Bench Vise is a thing of beauty. Though my skills can not match its capabilities, it is an absolute joy to use. I can't believe all the tying materials I have. During a three year period (ending perhaps 4 years ago) I believe my supplies increased about 10 times. I will never use this stuff up. But I think it is the result of fishing have many sub-hobbies. Acquiring good tools can be a hobby all unto itself. The same goes for the acquisition of nice materials, such as buying yet another hen neck from Charlie Collins or Denny Conrad. Finally, I have just now broken away from writing this post for a minute...to look at my fishing bookcase (3 shelves on a wall) and to take a photo of it. It's hard to believe that I have read all of these books. I doubt I have looked at any of these books during the last five years. ...No, that's not true. 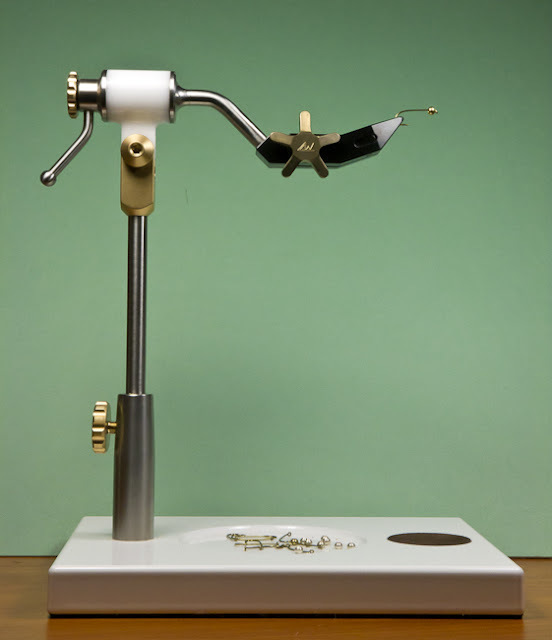 I have spent some time with the awesome Leeson and Schollmeyer's Benchside Reference, Hughes' Trout Flies, and Hellikson's Fish Flies. These are all fishing books, except the several Dummies books stacked horizontally on the second shelf. My other current "Serious Hobby" is photography. It consumes the energy and dollars that I once applied to flyfishing. As hobbies go, it is actually quite similar to flyfishing. I have a photography Web site (see link in the left side-bar) which includes a blog, just like I do with flyfishing! I might blog about the similarities some time. In the meantime I am wondering if I should sell most of my flyfishing books to make room for all the photography books I am buying. ... No, I don't think so. 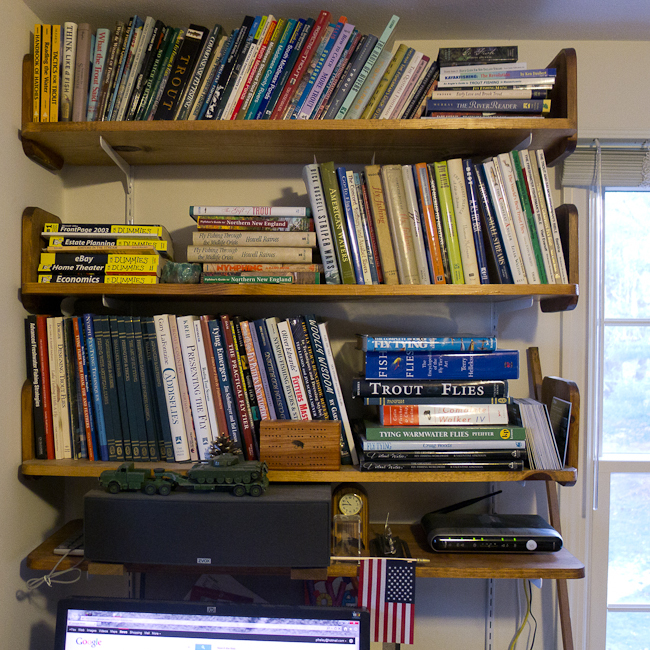 More likely, I will just build another shelf (or two or three) in my den (a.k.a. Pete's Playroom). I think the two hobbies live pretty well together. Peter, My goodness you sound a bit depressed. This post reads like a eulogy to your fly tying and fishing. At least your collection of books, fly tying material and tools, and your rods and reels are all neatly arranged, whereas my own accumulation of such worthy items has totally gotten out of hand, or so my wife tells everyone. She is also fond of mentioning to acquaintances that our house is decorated in early Trout Unlimited. Come to the shows and renew your spirit. Hang with us afterwards when the story telling begins. The afterglow is often more interesting than the show. It is precisely the tonic you need. Hi Bob. Yes, I'll stop by and see you at the Marlboro Show. I am a very big fan of the Jvice, and that Law looks equally impressive, although I was not previously familiar. This is a very good blog, and I hope you can evolve the blog to include fly tying/fishing photography lessons. I am just looking to get into it, as the nature I'm within while fishing is too beautiful not to capture. If you can recommend any books on photography, or fly fishing photography specifically, I would enjoy that very much. Best of luck with you in 2012. If you want to sell any of those books, let me know. I'm a collector of sorts. Peter, great blog. I think my previous attempt to comment failed, if it is a duplicate I apologize. I am a huge fan of the Jvice, I believe it is the best vise on the market today. That being said, I was not aware of the Law vise, which looks very well made, just like the Jvice. I will have to do more research. I am just getting into fly fishing related photography, please include some blogs in the future about the blending of both of your passions and talents. If you can, do a starters guide or some introductory blog about equipment, basic techniques. I'm sure many of us out there would appreciate it. If you are ever looking to sell some of your books, shoot me an email and a list. I'm constantly expanding my library, and I've found that buying them from a secondary source has been a great way to do it. Best of luck in 2012. NJ Fly, Thanks for the note. Be sure to link to my fishingwithflies website with lots of flytying stuff. The link is in the left hand sidebar, near the top and under the rainbow trout image. This blog was designed as an adjunct to the Website. Hope you find something there you like! Thanks in advance for looking. Dan, I think I did publish your comment twice. Sorry about that. I have things set up so I need to approve each comment before it can be published, and I just now looked and approved both. I think you might find some interesting things on my Website (see my note to you above)related to photography including some of my first recommendations on point 'n shoot cameras to take along fishing. And a review of the Jvice.Funny you should ask about photography and flytying. I am working of a series of blog posts about photographing step-by-steps . Hope you will like them. Peter, Meant to tell you that I've done fly props for TV and a magazine ad. First were BW Spiders and in September 3 yellow jacket wasps for the TV show Royal Pains. Should be on in January when they start up again. They just started going thru the alphabet and the first one they called was the late Fran Betters, a long time friend. Jan, his widow answered and gave them my name. Then they called back again a few months ago. The mosquitoes were for a photo shoot and the guy in NC got my name from Graham Owens who does this type of thing on a regular basis. I don't look for it, but if it comes my way it's a challenge. Problem always is they need them in a few days and I always end up using 'express overnight mail.' Or, they'll tell me, Oh, we need to be able to articulate the legs. The skeeters are for an ad for Stop-Itch. well, it gets me tying. As you know, just like writing the hardest part is getting the seat of your pants in the seat of your chair and doing it. I also never know what to charge, so I charge the same as what collectors pay for a loose fly. Good thing is I don't have to mount them. That's really cool. I didn't know you were in show biz. LOL. I'm planning on stopping at your booth on Friday, the first day of the Marlboro show.